Seven area Rotary Clubs – members of Rotary International’s District 6440 are working closely with Sterling Rotary Club, Sterling, Illinois, part of District 6420, to deliver on a recently approved Rotary Foundation Global Grant valued at approximately $60,000. The aim of the grant is to make a lasting positive difference in the lives of impoverished rural communities in Guatemala. Because Rotary International is a network of volunteers with a common mission of “Doing Good In the World,” the Illinois contingent is partnering with Guatemala Sur Rotary Club, part of Rotary District 4250, in order to have the knowledge and expertise in-country to make the investment a success. 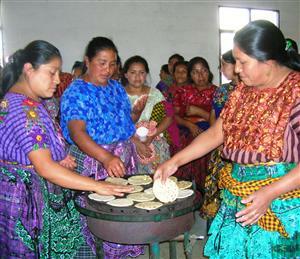 Resources through the Rotary grant will directly help the indigenous people in the Sacatepéquez region of Guatemala. Health, wellness, education and literacy, along with vocational training are intended to foster greater economic security among these poor farming communities. An elementary school for girls at Santa de Maria de Jesus, called Proximos Pasos is one of the primary beneficiaries. The region is challenged to provide residents and children with adequate food sources – particularly in the form of protein. The Rotary Foundation Grant pays for a new and highly versatile soy milk machine to be operated at the Proximos Pasos girl’s school. A byproduct of the milk process, called “Okara,” is a protein-rich material that is ideal for making baked goods like bread and cookies. Not only can the soy milk and baked goods be enjoyed by the students and families, but they can be readily sold at markets to others in the communities. Rotary will equip a new computer lab at Proximos Pasos and will provide staff and students training on how to use them. Creating an environment that fosters learning and personal growth only begins with providing the right educational tools. Vocational training to young people in the villages will be accomplished at the nearby Escuela Vida y Esperanza School. There, students will be provided with new equipment for wood and metal shops. The goal is to provide both the tools and the knowledge to be able to create goods that can be sold for profit that can be reinvested in the communities. Bathrooms will also get much-needed renovation for the students. Materials necessary to build “bio-sand water filters” for improving the quality of drinking water will be delivered as well, since water-borne pathogens are a constant threat to the community and to the children. Many students have been forced to miss long periods of school due to illness or to remain at home to care for other family members who have taken ill due to contaminated water. To complement the filtration systems, three area villages will benefit from new chlorinated water wells. Water and sanitation are only part of the equation in being able to lift up the communities and make them more self-sufficient. The global grant is a joint effort of the following clubs: Barrington Breakfast Rotary Club, which has taken the lead on the project, Crystal Lake Dawnbreakers, Dundee Township, Evanston Lighthouse, Lake in the Hills, Palatine and the Schaumburg-Hoffman Estates Rotary Club, along with the Sterling Rotary Club located in Sterling, Illinois, and the Guatemala Sur Rotary Club. The other partners for this grant are: Mission Impact, World Soy Foundation, World Initiative for Soy in Human Health (WISHH), and National Soy Research Center (NSRL) of the University of Illinois, Urbana, IL. The project meets a challenge made by Rotary International President, Ray Klinginsmith this year; the goal is to think, “Bigger, Better, Bolder.” How does this Rotary grant accomplish that? Bigger – The project is valued at almost $60,000 and involves three Rotary districts, nine clubs, three different non-governmental organizations (NGOs) and an international university. It’s expected that it will benefit more than a thousand Guatemalan people. Better – Each component of the project has been set up as a mini-enterprise with sustainability and self-sufficiency as its goal. It promotes empowerment, not dependency, opportunity, not charity, and engages all levels of the community. Bolder – The project is the outcome of bold initiatives in creating partnerships between many constituents and took significant effort to raise the necessary funds.